I discovered Carrots à la Fermière, or Farmers Carrots, in ‘The Monet Cookbook, Recipes from Giverny’. 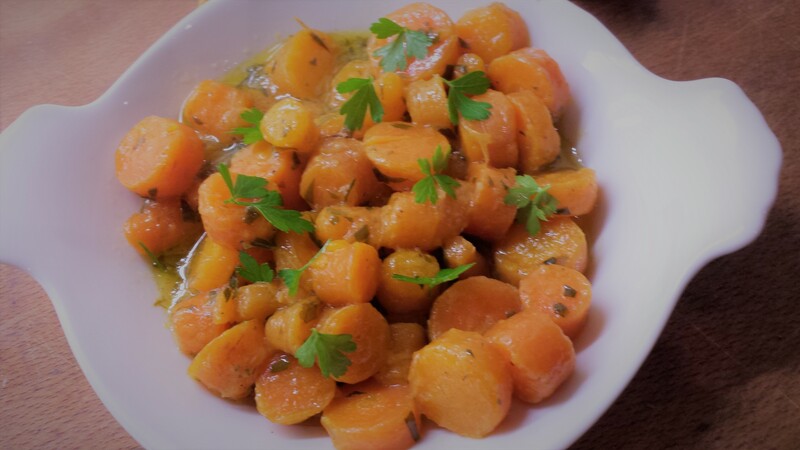 This very simple and delicious way of cooking carrots creates a lovely sauce with hardly any effort and the carrots remain firm not mushy even though they cook in the sauce. As we head into Autumn this is a dish I will be making often. Try to find carrots that are sold with their tops on, not because you will use the carrot tops but because they will likely be local and not woody in the center. Or at the very least use loose trimmed carrots. Try to avoid a bag of already peeled and trimmed carrots which have been washed in chlorine and will dry out quickly in the fridge. I recently served these Carrots à la Fermière with slow-braised pork belly with fennel and it was a delight. The bright orange of the carrots on the plate and the lemony taste of the sauce was a perfect contrast to the rich crispy pork and the soft licorice taste of the braised fennel. But it would also perfectly sit alongside a roast chicken or a pork chop! The original recipe for Carrots à la Fermière called for making a roux with flour and butter. I found that a bit gloupy and overwhelming. Instead I used a mixture of beurre maniè, the carrot cooking liquid, lemon juice and butter. This produced a lighter, brighter sauce without any real effort. This will be your go to carrot recipe for the winter! Lemony butter sauce and melt in your mouth carrots. Step 2 season with salt and cook for about 15 minutes over high heat. The carrots should still be firm. Drain, reserving liquid. Step 4 reduce the heat to low. Cover and simmer for about 1 hour until sauce is reduced to a few tablespoons . Sprinkle a last bit of chopped herbs before serving.